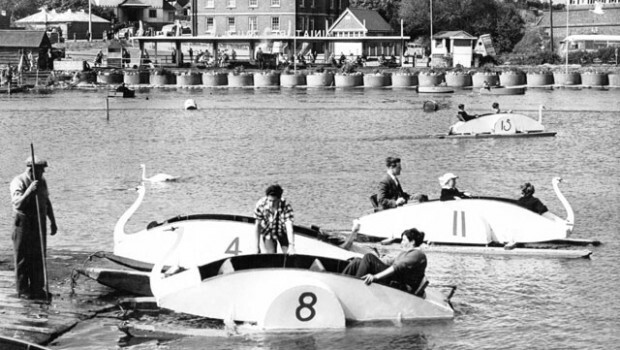 The Swan Pedaloes on the Radipole Lake in the late 1950’s. These brutes were constructed out of marine plywood and were immensely heavy and hard to pedal. 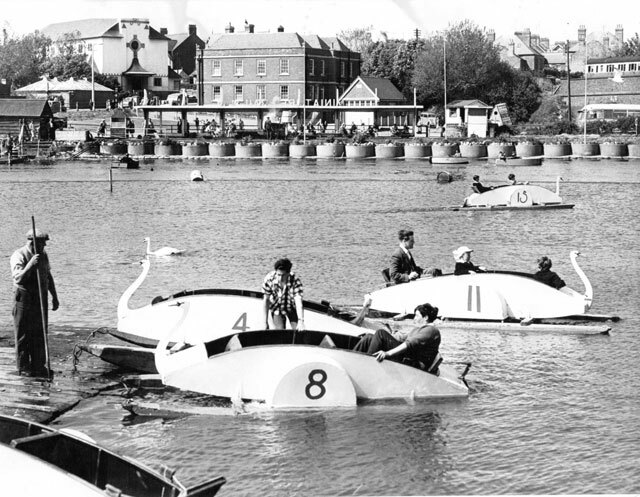 The wooden floats would gradually let the water in so that by the end of the day they were even heavier (look at the aft end of number 8 in the picture to get an idea of how low in the water they could get). The bungs were removed and they were emptied at the end of every day and overnight they were kept on the jetty. Eventually they started to fall apart – the heads and necks came adrift first, so they were used for a season or tow without them. After that they were scrapped and never replaced. Nice to recall rides from the Weymouth Miniature Railway Station seen on the opposite bank – a 1950’s favourite.